It’s totally summer and I’m super happy about it. Yesterday we spent the afternoon at the pool, my kids are finally at great ages to be at the pool for more than 30 minutes and I have a feeling we’ll be there most days this summer. Summer means lighter dinners to me, after spending all day in a bathing suit I’m usually not in the mood to woof down a meat and potatoes type meal, agreed? 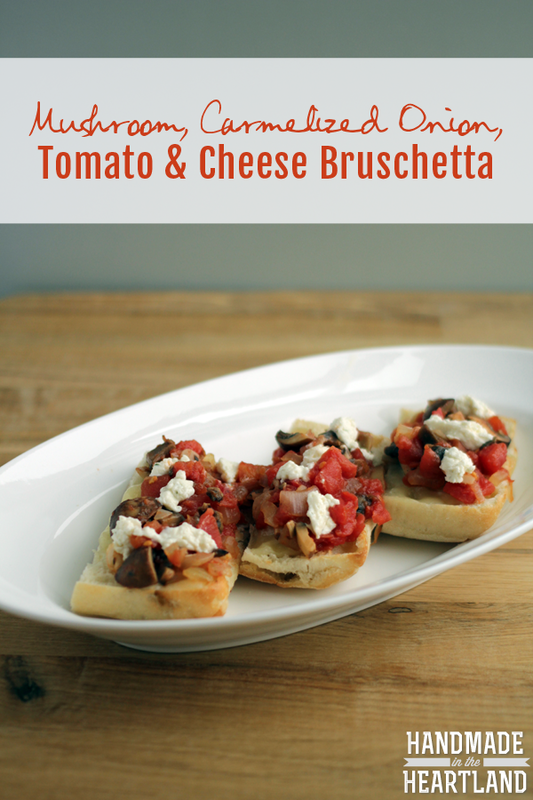 So in walks this ahhhmazing bruschetta. Seriously I’ve eaten it for 3 days in a row and I’m not sick of it yet. 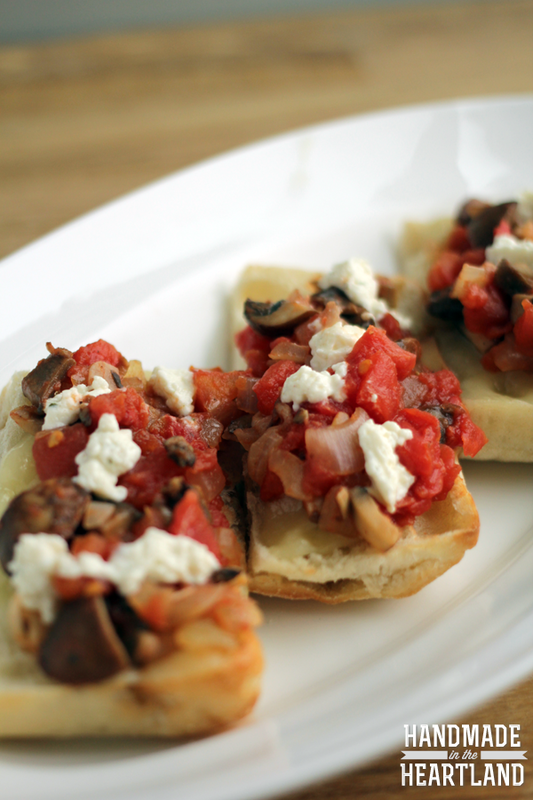 It’s not your typical bruschetta for starters it’s hot, which in my opinion makes it feel more like a meal, and its got mushrooms and delicious Hunt’s best canned tomatoes in the topping. After getting all ingredients purchased at walmart I came home with high hopes of this dinner and it totally delivered! The more I eat it the more I feel like you could make the same saute (the topping) to top pasta and it might feel even more like a dinner if topping ciabatta bread isn’t your thing. yum. 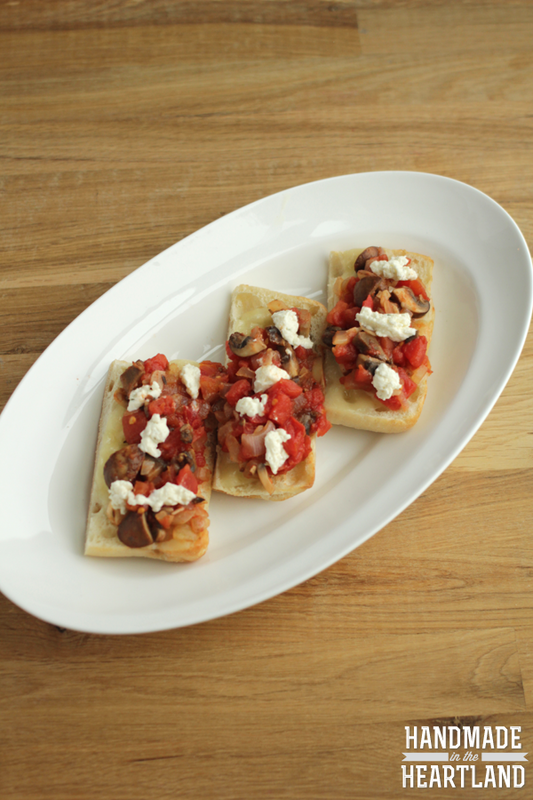 What makes this dish so delicious is the layers of flavors- caramelized onions, mushrooms, tomatoes, and herbed goat cheese all topping melted provolone. mmmm are you hungry yet?? Did you know that Hunt’s tomatoes are all peeled using a flash steam method with only water, no chemicals? AND all the tomatoes are grown in California, I’m a fan of supporting american agriculture. If I can’t get a good home grown tomato I like Hunt’s canned tomatoes better than chopping up a grocery store tomato that is a pale red- you know the ones that barely have any flavor? yuck. 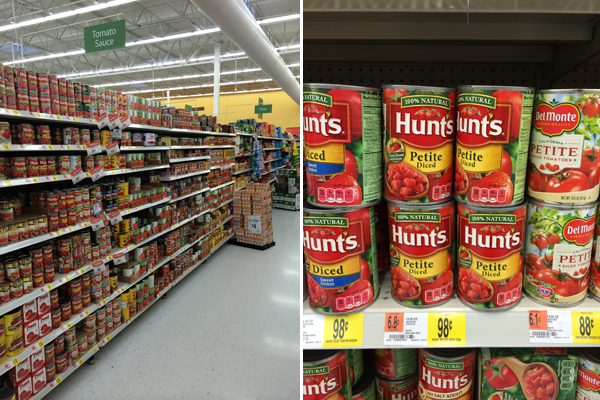 I know with Hunt’s canned tomatoes my dish will be packed with the tomato flavor it needs. Prep your bread by cutting the buns in half, so they are long skinny pieces and then put them on a baking sheet inside facing up. Place half a slice of provolone cheese on each piece of bread. Melt the bread in the oven for 5 minutes at 300 degrees. Make the topping. In a saute pan over medium heat toss your diced onion with a tablespoon of olive oil and cook until they are browning and caramleizing- about 10-15 minutes. You may need to turn down the heat to medium-low after 5 or so minutes so they don’t burn, you want a nice golden brown color. Once the onions are browned add the mushrooms and garlic and cook until the mushrooms have released their juices and are tender, about 5 minutes. Add the drained Hunt’s petit diced tomatoes and cook just long enough to warm the tomatoes up, about 3-4 minutes. 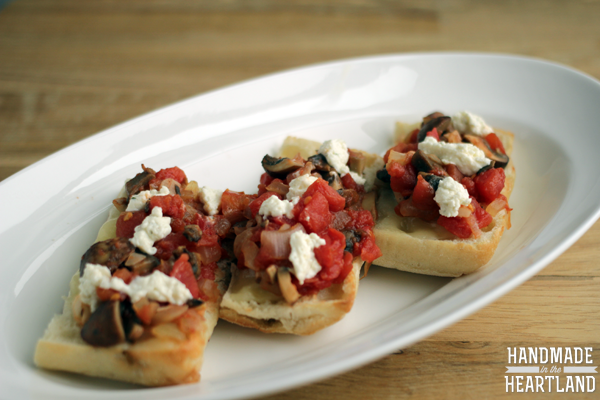 Assemble the bruschetta by topping each piece of toasted bread with a spoonful of the tomato saute and then add dollops of herbed goat cheese to top it off. Serve immediately and enjoy! 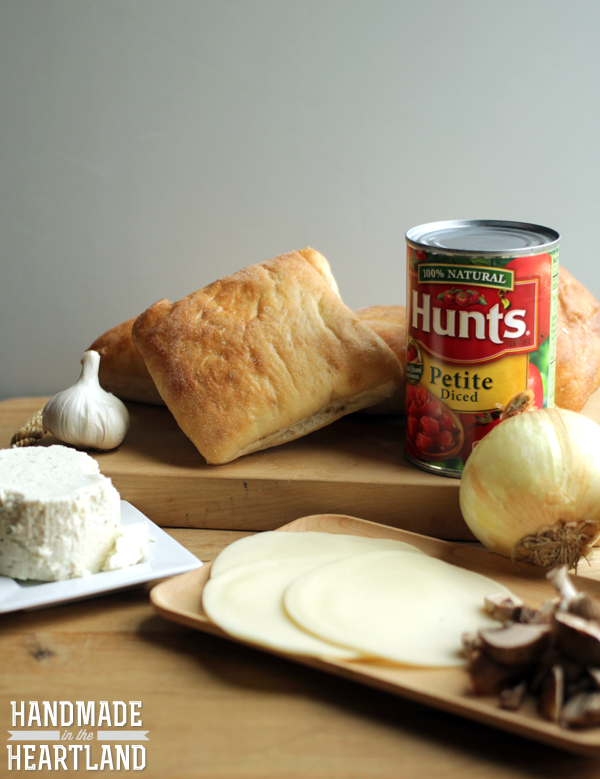 You can get more recipes for dishes using Hunt’s tomatoes HERE and HERE. Also follow them on social media (especially they’re awesome pinterest boards) to get all the latest! This post was sponsored by Hunt’s, thanks for supporting the brands that support Handmade in the Heartland!